You will need some plastic. You do not need bubble wrap. I got some plastic sheeting that is fairly sturdy – probably 3 or 4 mils thick – from Home Depot a few years ago. The stuff will last forever. I cut it into pieces that are easier to handle. The piece I use most often is 40 inches wide x 90 inches long. I fold it in half so it is 20 inches wide x 90 inches long. Then I put the roving on the plastic and pull it out a bit further – so it is almost as wide as the plastic, but not quite. Then, you will also need water. I like this little pump sprayer – Solo 418 One-Hand Pressure Sprayer, 1-Liter – as it makes a more gentle spray than most pump sprayers. 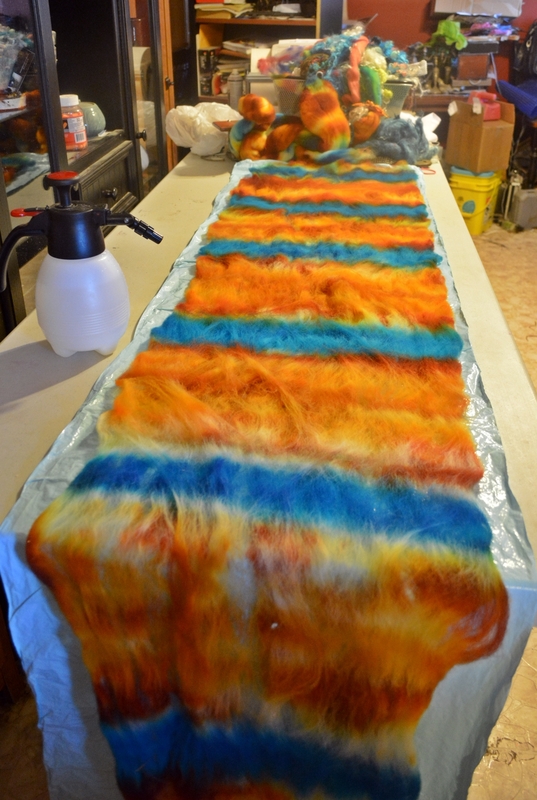 I start spraying the roving with water – I go about 18 inches at at time, and I squish it gently with my hands to get the water to soak in better. You can, on this first wetting, add a tiny bit of Dawn to the water to help the wool absorb the water. As the wool roving gets wet, I start to add some embellishments. In this case, I’m adding some tailspun yarn I spun that is the same color blue as the blue stripes. I add it after I wet down the wool, and then I make sure that the yarn is also wet. Then I start rolling the scarf up in the plastic – I just fold maybe 3/4 to 1 inch over the wool to start, and I start to roll it. 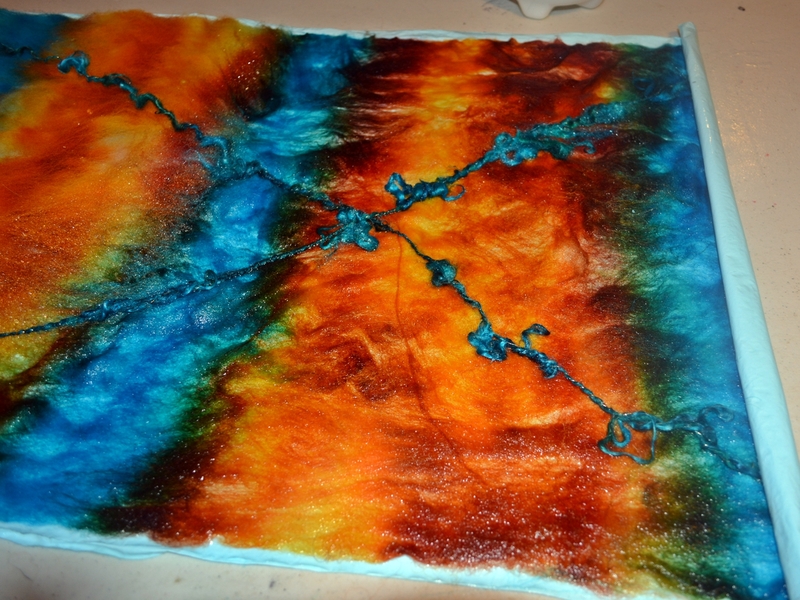 Then I do more wetting and embellishing and then more rolling. I continue on until I have wet down the entire piece. 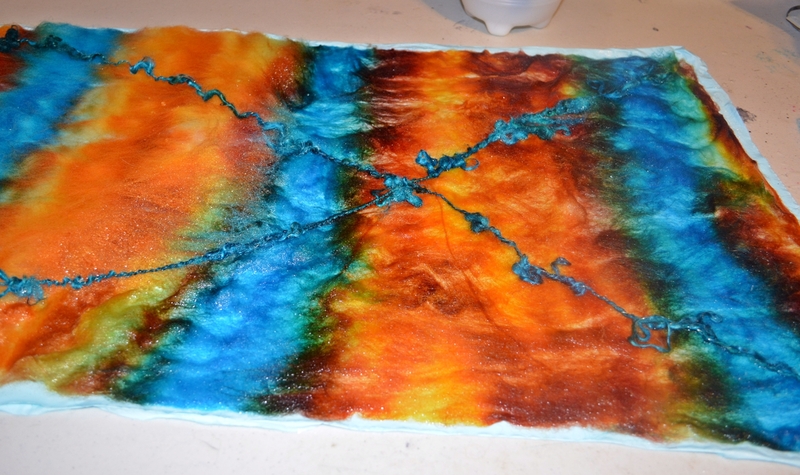 This entry was posted in Cobweb Felted Wool Scarf, Tutorial and tagged cobweb, how-to, plastic, scarf, tutorial, wool. Bookmark the permalink.